Don’t get your britches in a bunch because I use the word “crazy.” You get it. We all use it in a slang sense, not in a judgmental sense. And as business people, we’re driven crazy daily by something. Frustrated. Annoyed. Riddled with anxiety. Fretful. Worried. The emotions are all over the place when we’re going crazy. Your mental health is important. You’ve got to take it more seriously. Business stress coupled with personal stress can overtake us. Wreck us. Send us down a rabbit hole of despair. Even if we’ve had no history or sign of genuine mental health challenges. Some of my best friends suffer a variety of real issues. Serious issues. From clinical depression (as opposed to the generic kind we all get, and call “being depressed” when we just mean we’re sad, etc.) to bipolar disorder to high anxiety and a variety of other things that require medication. Most of them know the seriousness of their situation and they take care of themselves. That is, they continue to take their medication as prescribed. They seek help from qualified therapists and other mental health professionals. A few of them don’t. They start feeling better and stop taking their meds. They stop seeing a professional. “I’m all better now” thinking creeps in and they fall into delusions of thinking they no longer need to do the very things that helped them. They’re wrong. Those of us who care about them urge them to go back to doing the things that benefited them. Sometimes they do. Sometimes they don’t. As we learned with Kate Spade’s recent suicide and what her sister revealed, Spade suffered for years. Sadly, her sister and others were unable to get her to seek and accept the help she most needed. Entrepreneurship and business ownership is hard. Very hard. Even when it’s easy, it’s hard. That doesn’t mean it’s not rewarding. Or not worth doing. It just means it’s hectic, exciting, demanding, time-consuming, life-consuming, and a host of other things that can disrupt other areas of our life. 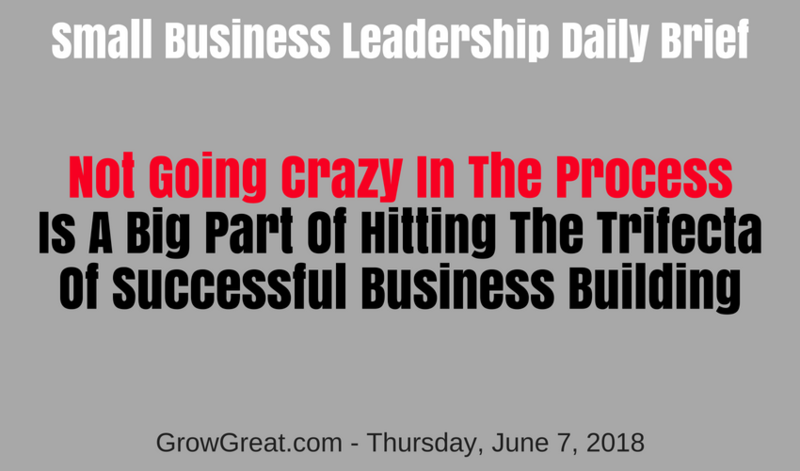 Which is why many years ago as I formed what I called “hitting the trifecta of successful business building” I purposefully included that last one, which has grown to be THE most important one – not going crazy in the process. Business owners consume themselves with the first two legs of the trifecta – getting new customers and serving existing customers better. Often to the complete neglect of the third leg of maintaining their best mental and emotional well being. You own the business. So much rests on you. Everybody is expecting something from you. People pressure you constantly for a decision, an opinion, a thought, some help, some action. Your confidence and tenacity help build your business. You think you’re immune from the pains mere mortals suffer. Well, deep down you know better, but you’ve been so immersed in the “never let ’em see you sweat” mindset that you don’t know any other way to perform (or behave). And it’s taking a toll. On your business’ most valuable resource. YOU. You maintain your company assets. Got trucks? I’m betting you wash them and have them regularly serviced. You probably also stress taking care of them to the people who use them daily. Trucks aren’t cheap. You want them to last as long as possible so you take care of them. When one goes down, it disrupts your business. Plenty of reasons to take care of them. So it goes with other assets you’ve got. Then why don’t you take care of YOU? Physically, mentally and emotionally. Your doctor will urge you to lose weight, eat better and exercise. Your physical shape is more easily seen than what’s going on in your head. Which is why “not going crazy in the process” is so critical and urgent! You can be dying inside, ignore it and find yourself going down a path of self-destruction. Business leaders misbehave constantly in attempts to fill voids of connection. Drugs, alcohol, extramarital affairs…even worse. And these are the most apparent destructive things we tend to consider. But there are other things we avoid thinking about, things we may not consider — like how well we perform as business owners. You want your employees, trucks, machinery and everything else inside your business to operate like that proverbial “well-oiled machine.” Then why don’t you want to perform up to that standard yourself? What makes you think you can continue to erode your mental and emotional fortitude and operate at your peak? You’re fooling yourself. Stop it. We all need deeper connections with people we feel safe with. People who will listen to us without judgment. People with whom we can confide things, knowing they don’t expect anything from us – and they won’t use what we confide in them against us. It’s perfectly natural and right to crave these connections. We all do. Some of us just work harder to suppress them than to find them. Foolish. Today’s the day to start exercising greater wisdom. Give yourself the attention you and your business deserve. The upside is that it won’t just benefit you. Your family, employees, customers, suppliers and everybody else whose life is impacted by your business – they’ll all benefit, too. It’s the most positive ROI thing you can do because it has NO downside. Previous post: Small Business Leadership Daily Brief: June 6, 2018 – If Everything Is Important, Then Nothing Is Important!